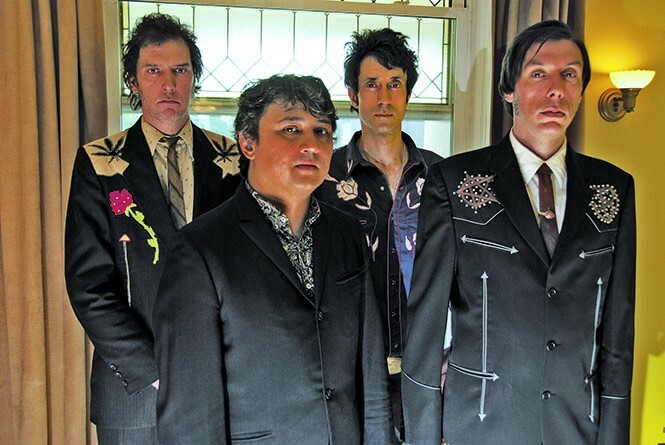 Canadian band The Sadies are content with American cult status. After more than two decades—and an album to show for almost every one of those years—The Sadies certainly have proven their mettle. Still, the fact that they reside north of the border has tempered their progress. Like other Canadian combos—Blue Rodeo, The Tragically Hip, Skydiggers, Blackie and the Rodeo Kings, Spirit of the West—they champion a sound they've dubbed "Canadiana," one that's as roots-relevant as any of their American cousins. Their 2010 album, Darker Circles was shortlisted for Canada's prestigious Polaris Music Prize, and later garnered a Juno Award for best video. Sadly though, due to setting or circumstance, The Sadies' work has but been all ignored on the lower side of that northern divide. Singer/guitarist Dallas Good says it's always harder for Canadian artists to get recognition in the United States—at least compared to the relative ease that American acts have on the flipside of similar situations. For one thing, visas are expensive and difficult to get, making a tour of the U.S. a logistical nightmare for many non-native bands. Good appears to keep it in perspective. "I don't see it affecting Drake or the Biebs of course, but whatever," he says. "I certainly don't blame the public for never having heard of me." It's not as though The Sadies aren't successful in the States. They're just—as with their aforementioned musical countrymen—relegated to a sort of cult status on this side of the border. That's not such a terrible thing; cult bands are rich in respect, both from critics and their fellow artists, and The Sadies have a seemingly never-ending parade of similar artists to collaborate with, including fellow Canadians Neko Case and Tragically Hip frontman Gord Downie, as well as non-Canucks Jon Langford (The Mekons, The Waco Brothers), John Doe of X and soul man Andre Williams. They might not be famous, but Good and his colleagues (brother, vocalist and guitarist Travis Good; bassist Sean Dean and drummer Mike Belitsky) seem to have it pretty good. Currently, the band—pricey visas in hand—is in the midst of a six-week American tour with Justin Townes Earle. Good says it's going well: "We still haven't killed each other or even attempted to do so." They're promoting their 19th album, Northern Passages, released earlier this year on Yep Roc. Their most definitive effort yet, it's a combination of harmonious ballads and frisky rockers that reflect The Sadies' cornucopia of influences, which spans the late '50s through late '60s, and encompasses country Western, bluegrass, R&B, folk, instrumental rock and psychedelia. That blend has served The Sadies well over their lengthy career. The variety means the band can explore new territory without straying too far from their creative home and alienating fans. "I don't think I'm very concerned about repeating myself," Good says. He feels the band is still evolving, but, even if his music ever does get redundant, "It's better than repeating someone else." There's also something to be said for knowing oneself as an artist and, in spite of any logistical obstacles, staying steady as she goes, eyes focused on the horizon. That's how bands thrive and continue to make records, even if they're not breaking any. "We may be a one-trick pony," Good says, "but the trick is getting really good." He hopes that audiences—at home, Stateside or otherwise—will concur. He describes a Sadies concert as a great show that boasts a fair share of surprises. "We provide an environment that's conducive to having a lot of fun," he says. "It's scientifically enhanced. Factory adjusted. Like a Petri dish full of good times."